Here is a cool pic I just got sent from a friend. Its his Granpa`s Harley. Not the very best bike pic, but as from what i can see this is a early Panhead(tombstone rear lamp). This is the only Panhead I have come across from "old days" in my area. Quite sure this is an import as there where no dealers in Norway after WWII. OK, I`m allready corrected (by e-mail) that this is not a Panhead. This bike is still around (tough in another part of the country). It`s a 1941 80" ULH that was imported with the "wrong" tail light. 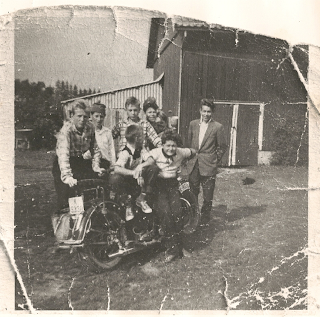 I have allso learned the photo is taken in 1959-60 as one of the guys in the pic is one of my friends father.